I think I've mentioned it like ten times now, but I have a serious soft spot for appliqué and hand stitching. So of course I'm super in love with everything Jacqueline, of For the Record makes. Check out her shop, it's full of lovely handmade items like cosies, blankets, embroidered notebooks... just too much cuteness for anyone to handle! 1. Template: First I draw out the template size of the object onto paper. 10 minutes spent looking for ruler and pencil, 1 minute drawing up the template. 2. Choosing Materials: Select and cut out the base material and lining. 1/2 hour - usually done before sleeping the night before. 3. 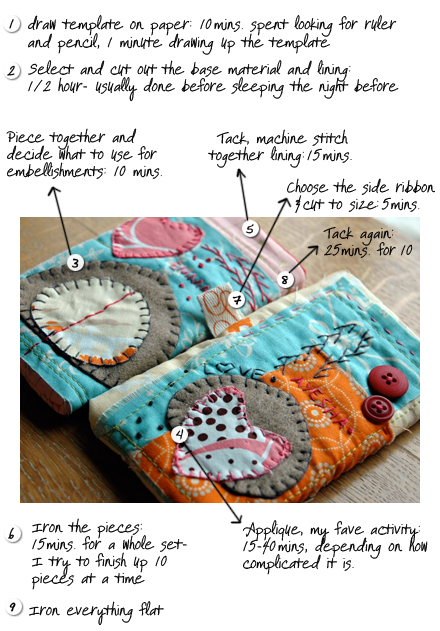 Piecing and embellishments: Piece together and decide what to use for the embellishments on the front of the cosy. 10 minutes. Done in the car (while husband drives) with fabric spread all over- I try to avoid wearing black for work as the threads tend to get stuck onto my clothes! 15 to 40 minutes, depending on how complicated it is. I sometimes do a whole series, then come back for a second round and add more stuff to the. All done in the car, makes the early morning car ride much more enjoyable. 6. Ironing: 15 minutes for a whole set. I try to do 10 copies at a time, it's more efficient this way. wow! and doing it all in the car? Amazing and lovely! I am off to check out her sweet shop! i'm a big fan of jacqueline's work! great heart lab feature. Jen, thanks! Jacq is one talented and sweet lady!